People come from all over to visit Chip and Joanna Gaines’ Magnolia Market at the Silos. 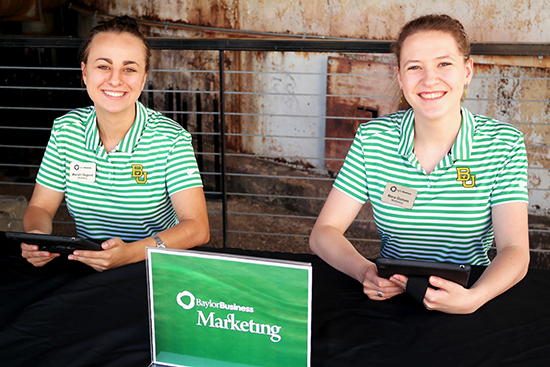 In May, Baylor Marketing seniors Mara Gomen and Mariah Osgood had the opportunity to talk with visitors about their experiences at the “Fixer Upper” landmark. This is the second time Baylor students have partnered with Magnolia for a Directed Studies in Marketing course. In this class, Gomen and Osgood worked alongside the Magnolia team to gather insights about customer satisfaction and expectations. These results were then compared to outcomes from the previous study completed in 2016. Gomen and Osgood were responsible for tasks such as distributing a Qualtrics survey, analyzing the results, and providing recommendations for the final presentation to the Magnolia team. Osgood said she benefitted from this opportunity because it allowed her to see all of the ins and outs of operating a company like Magnolia. She was also able to gain real world experience working as a marketing analyst.